ihosoft Android Data Recovery for Mac is a powerful Android data recovery software that enables you to recover accidentally deleted or lost photos, music, videos, messages, contacts, call logs, WhatsApp messages, Viber chat history and so forth from Android phones and tablets effortlessly. 1. 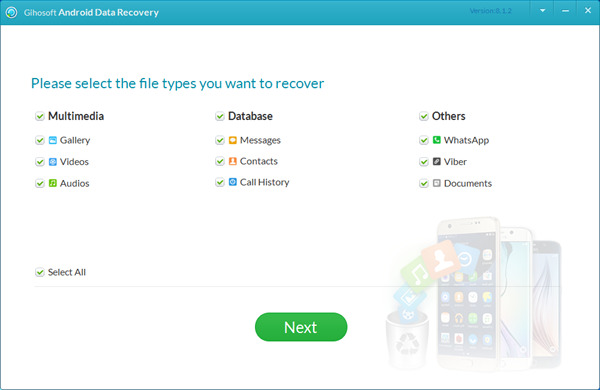 Recover deleted Android phone data, like contacts, messages, call logs, photos, music, videos, WhatsApp and Viber conversations, etc. on Mac with one click. 2. Works perfectly with numerous types of Android devices, such as Samsung, Huawei, LG, HTC, Motorola, Google Pixel, OnePlus, Sony, Lenovo, ZTE and so on. 3. Fully compatible with Windows and Mac platforms. Thus, when you download this software, you are no need to worry about compatibility issues. 4. Supports various data loss situations, for instance, accidental deletion, device rooting, factory settings restoration, software crashes, virus attacks, etc. 5. Features with in-depth data scanning technology and powerful anti-deletion capabilities. No matter your data is lost for whatever reason, you can quickly get them back with this software. 6. It's very easy to use: Download, install and run this freeware on your Mac computer > Connect Android phone to the computer > Scan, preview, and recover deleted files from Android. 7. It's free to try. You can try the free trial version before purchase, and even after your purchase, we offer a 30-day money back guarantee. 8. The software is safe and reliable. It does not carry any malicious code and bundled plug-ins, nor steal personal privacy information. You can use it with confidence. With Android Data Recovery for Mac software, you are no longer afraid of data loss! Mac OS X 10.11/10.10/10.9/10.8/10.7/10.6/10.5, macOS 10.12/10.13/10.14; Windows 10/8.1/8/7/Versa/XP. The fresh version of Gihosoft Android Data Recovery for Mac has re-adjusted the algorithm, repaired several bags, which can quickly help users recover deleted files from Android. After several cross-tests, it's finally released. android data recovery for mac android file recovery mac android data recovery software for mac recover deleted files on mac.